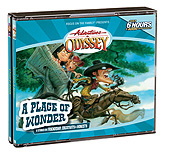 The Official Podcast occasionally provides free episodes of Adventures in Odyssey for free, with the latest podcast as no exception. You can now listen to the episode Wonderworld via the latest Official Podcast. In addition, you can hear a special behind-the-scenes interview at the conclusion of the episode with writer Phil Lollar and Gabriel Encarnacion, voice of Lawrence Hodges. It’s a podcast you won’t want to miss! Click here to visit the Official Podcast.